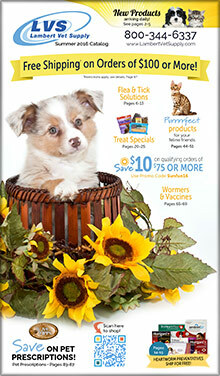 For quality pet medications and vet supplies at the most competitive prices, there's Lambert. With over a decade of experience, Lambert Vet Supply strives to provide quality pet supplies featuring medications for dog joint health and the perfect flea remedy to rid your pet of dog fleas or cat fleas for good - all at affordable prices. Vet supplies - From Frontline products for cat fleas and dog fleas to the most reliable Oster grooming clippers. The folks at Lambert work closely not only with pet owners, but with trusted veterinarians to ensure that all of the vet supplies and pet medicines that stock their shelves are the most effective medications available for your beloved pets. Whether you are dealing with dog joint health, cat fleas, dog fleas, heartworm, or chronic cat health or dog health problems, Lambert has exactly what you need. Flea remedy - The four words pet owners hate to utter. "My dog has fleas". Whether your favorite pet is dealing with a bad case of dog fleas or cat fleas, you'll find the flea remedy you need to rid your home and your pet of those nasty critters. Choose from Frontline and Frontline Plus, Program Flavor Tabs, Advantage Flea Control, Sentinel Rx, Revolution Rx, and more. From spot ons to sprays, tablets to deflea shampoos, when you purchase a flea killer from Lambert, you can say bye bye to fleas forever. Dog health - For the finest in pet supplies and medications and with a dedication to quality cat and dog care, the only name to trust is Lambert Vet Supply. For any dog health problem, Lambert Vet supply provides the best names in canine care. Find the discount pet medication for dog joint health and arthritis, dog dental health, dog eye and ear care, Preventic tick collars, plus food, treats, grooming products and more. Before you know it, Sparky will be back to fetching that bone in no time! Cat health - For cat health problems, trust the online vet at Lambert. Find the right pet medicine for your cats health all in one place. From cat behavior meds to cat supplements, cat vaccines, hairball remedies, cat eye and ear care, cat dental care, cat wormers, products for cat grooming and everything else you need to insure you have a healthy, happy, and purring kitten waiting for you when you get home.